Long days full of sunshine are the genesis of so many good things—but especially casual, wine-addled parties. Let's plan. Today: Style writer Jessica Romm shares 10 clever ideas for serving drinks—both boozy and benign—that will make your guests swoon. Obtain a stop valve with a simple on/off handle at your local hardware store, plus a few inches of pipe screwed into it (for making it through the rind), and clean aggressively to elimininate any oils. Slice off just enough of the bottom of the rind of a watermelon to make it flat and stable. Slice off the top like you would a jack-o-lantern, set it aside, and hollow out the watermelon (preferably seedless) using a large spoon. Let the fruit strain while you work; the juice will naturally pool and you'll still have pieces to snack on. Using a paring knife, cut a hole for the tap towards the bottom of one side of the watermelon, a little smaller than your hardware to ensure that it's airtight. 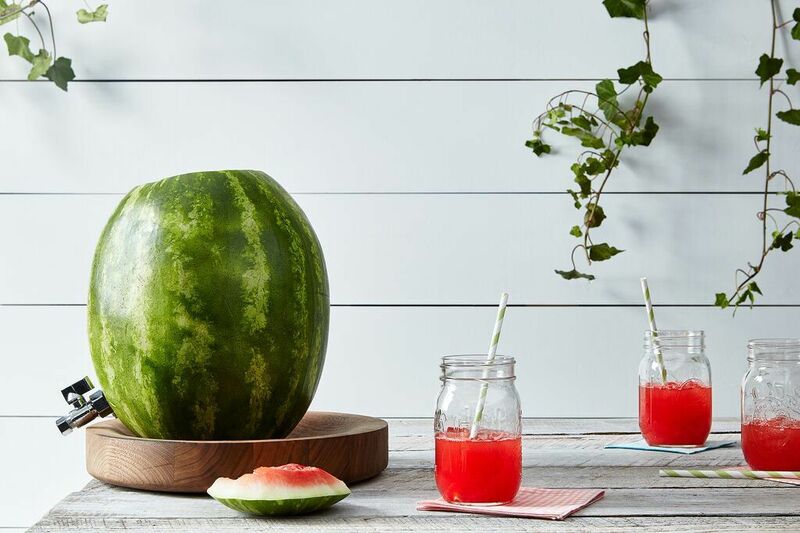 Tap your watermelon with the valve and piping by jamming it into the hole, checking inside to make it sticks through the whole rind. Fill your watermelon dispenser with the reserved juice spiked with basil and icy vodka, or any other drink you desire. Serve in chilled mason jars. 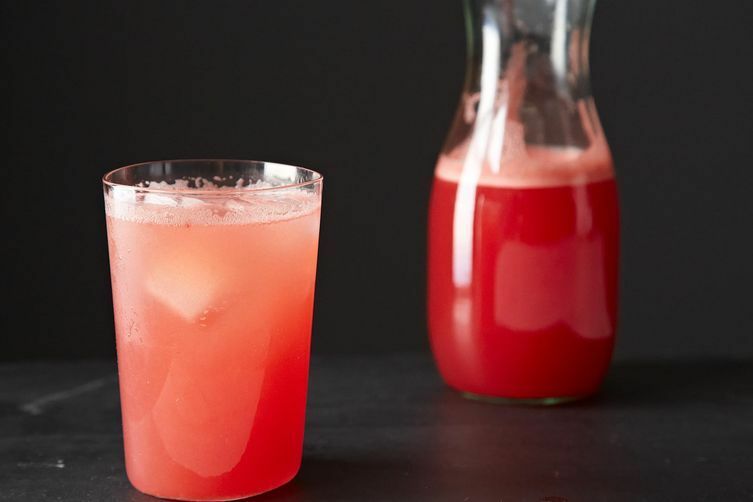 More: Fill your watermelon with this Watermelon Paloma. 2. Buy crushed ice. Crushed-ice cocktails are an instant party! With a little planning, you can make crushed ice at home in batches, but in a pinch just order it in bulk from your local ice delivery service, or try a fast food restaurant who you know serves it. It's a special touch that makes all drinks taste like a slushy. 3. Basil your water. Spritzing water with lemon is a no-brainer, but try swapping the standard out for basil in a refreshing twist. Just clean a bunch of basil, add it to a pitchers of ice water, and set it out on the table for greenery you can actually enjoy. If fruit's your thing, leftover strawberry tops also make plain water more delicious. 4. Add flowers to the wine bucket. 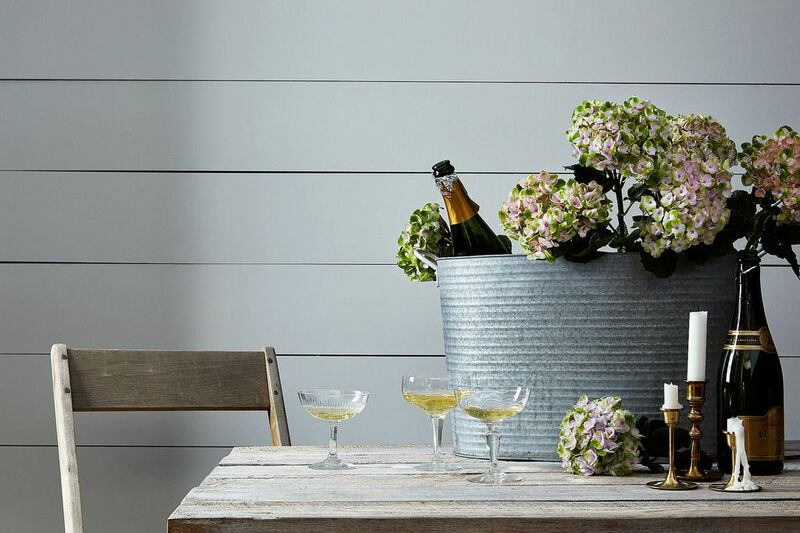 Inspired by the abundant large blooms of summer (peonies now, hydrangea in July and August), grab an oversized wine bucket, fill it will ice and cool water, and chill your wine, Champagne, and beers interspersed with fat stems of your favorite summer flower. A tip from Robin Standefer of Roman and Williams, it's such a pretty way to dress up a wine bucket or the top of a bar. 5. Be all about that brass. 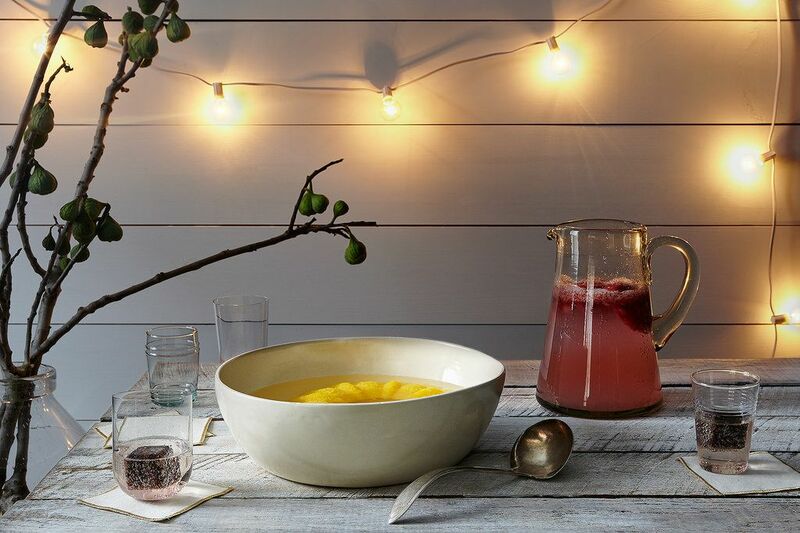 Pick up vintage brass ice buckets at a local flea market to place at every table (and bar) for decor, then pile lemons, limes, and olives into smaller brass bowls to accessorize. 6. Go big. For a really large crowd (or if you love to entertain and have a place to store it), invest in a rolling, powder-coated outdoor cooler (like an ice chest on wheels, as seen at at at Pubbelly Miami), and stuff it with all your bottles and cans for easy access you can roll away at the end of the night. 7. Fruit your ice. Fruit purées frozen into perfect cubes or spheres make summer spritzes easy to customize and mix. Blend fresh or frozen fruits, pour the slush into any freezable mold, and freeze them overnight. Pop the cubes (or one big round one, made in a Bundt pan) into punch bowls, pitchers, or glasses, add plain sparkling water, vodka and tonic, or straight Champagne for a new take on a spritz cocktail. Try blackberry, mango, or peach with basil. 8. Ice your glasses. Freeze a selection of pewter cups for about 15 minutes, then serve cocktails in them for brilliantly cold, classy drinks. 9. Stop your drains. If your party is last-minute or if you've got an eentsy apartment, be low-touch. Stock your thoroughly-cleaned sinks (or even your tub) with ice, then add bottles of wine and beer. 10. Go fish. Place a glass-walled rectangular fish tank at eye level, fill it with ice, and stock with pretty bottles of beer and wine for mesmerizing drink storage. How do you serve drinks at your summer shin-digs? Have you ever carved a #summerpumpkin (our new term for watermelons)? Tell us in the comments! Roll a wheelbarrow into the center of garden, place a large decorative piece of fabric over the whole thing. Mound with ice & stick bottles(preferably champagne) into the mountain! It's easier for the guests to help themselves too. Love #summerpumpkin! Definitely going to start using that term!